"At times, the roll → roll more → lookup → lookup on other table → think → narrate results part takes slightly too long for my tastes. (I'm a sucker for flow, and as a GM rather make up something slightly boring on the spot than spending time on looking up the cool thing in the reference manual if it speeds up gameplay.)" So, sure, I could just make stuff up, but then I like the Hypogean Karst so much that I want to show it to the players, also in the travel encounters, without diverging too much through improvisation. What's a GM/referee to do then? Of course, build better tools to support me at the table! 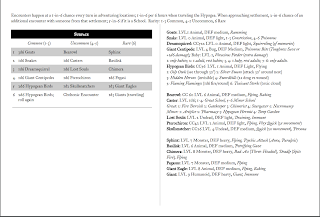 In a previous leg of the campaign I ran Night's Dark Terror (you can find a decent review at Dungeon of Signs), which sported a nice and compact encounter table with BX-style stat blocks that fit on a few lines as well. It was small enough that I was able to put it on my low-rise ref screen and quickly have a) the result of an encounter and b) the information I needed. Of course everything was statted out in more detail elsewhere, but leafing through the book occurred more rarely than the encounters did. So, why not emulate that here? I took to the Chthonic Codex volumes, especial Volume I cryptic creatures and Volume III mysteries & mystagogues. 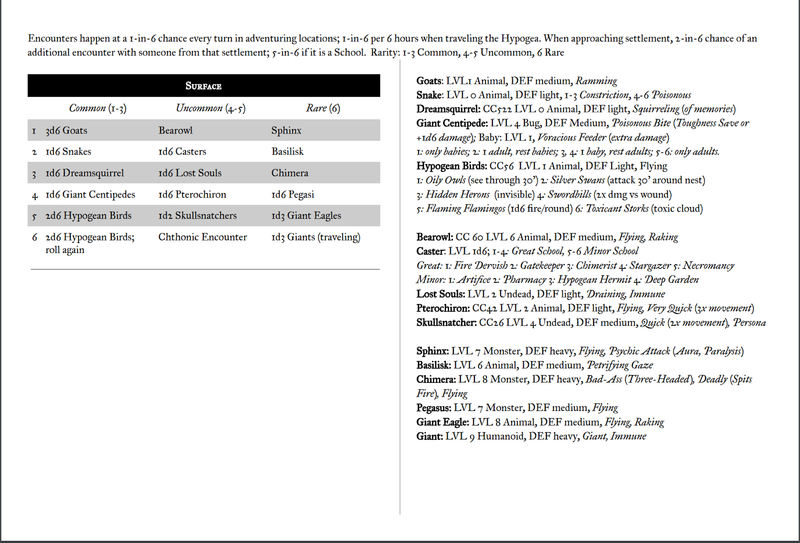 While the first has all the statblocks for the chthonic codex specific entries, the latter has the Hypogean Travel Shenanigans section that packs all the rules for encounters plus encounter tables for five different millieus terrain types (surface, chthonic, wet, tarry, interior) on a double page spread. And the tables contain a bunch of entries not covered within the confines of the published Chthonic Codex works, like the Giant Centipedes, Oozes, and Minotaurs of previous installments in this blog. So I added stat blocks for goats, snakes, casters, lost souls, sphynx, basilisk, chimera, pegasus, giant eagle, giant, giant snakes, gorgon, giant frogs, kelpies, hydra ... some entries are still empty (Mysteric Procession because that'd be more work than I currently want to dedicate, andd Apprentices for a similar reason (I should have a dozen pre-gens ready to have one or two memorable ones in every group and just use those). I bowed out on including the Hypogean Dragons because those are part of the manifold self-similar parts of the book that every referee needs to build out for themselves, resulting in a nice four-pager covering just the dragons. This again provides me with all I need: It is a lower tier entry, undead, not very much armed, and has the special abilities Draining and Immune from AFG pp 86-87 (since all the specials are mentioned on the same double page spread, I saved the reference). I re-used special features of some chthonic monsters for a handful of the missing monstrosity entries, but it should be more-or-less clear what Constriction does, for example. I did put all stat blocks for all entries on every terrain reference, so there is no flipping between the terrain references trying to guess where "Snake, Giant-" or somesuch might be found. If it's referenced on the table, it is on the page. This should eliminate the time flipping between books and trying to find things almost completely, getting closer to the ideal of Flow without sacrificing game-world canon by improvising too much. Next game is in a week, I will report back whether building these sheets helped, or were just a vehicle to re-visit the game material in-depth again. the ref screen had various tables on the inside for me as GM, and others for the players on the outside, but it was only 15cm high so I wouldn't lose cohesion with the table.